I loved your thoughts on words versus pictures! Some real poetry going on in those comments; if you haven’t read them yet, it’s worth your time. Today I have a story for you. When I was a child, my mother taught me how to fold socks. 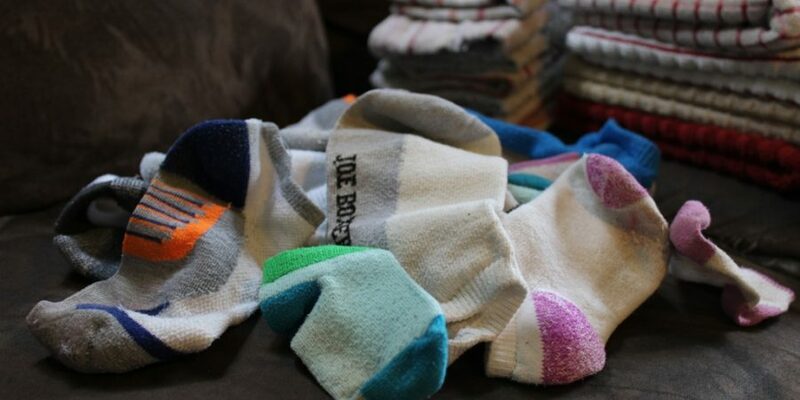 Folding laundry was often children’s work, and the tedious minutes we spent poring over socks appear in retrospect to have stretched out over several decades. This pile was all Dad’s socks, and all white Hanes with gray heels and toes, but which sock went with this sock? There were small clues, slight pilling on the upper section, a darker sole, some more worn than others, marks where he wore a pair in the mud. We practically pulled out our magnifying glasses, comparing, agonizing, trying to get it right. You learn something new every day; but I did not switch back. And so you see I am telling a parable (though it is also true) because sometimes living is like that. You study and hover and sweat trying to get it exactly right, and then sometime, perhaps much later in life, you realize what it was. It was just laundry. And now the game is funny but you find that somewhere along the line, you made a promise to yourself never to play it again. You are done spending years of your life folding socks. I’m not sure if you know what I mean. Posted with the permission of my lovely mother, who taught me 90% of everything I know about housekeeping. All but the socks. Love you, Mom. Hmmm… sometimes I wonder if I spend too much time “folding socks” … when I should be blessing, and loving the wearers of the socks in other ways that have more eternal value? You learn that what once seemed so important just isn’t worth stressing over anymore. PS. I don’t even fold socks. I just put them into the right drawers in (kinda) neat piles, and we all sort out our own pair when we need it. I always attempt to match socks according to age, discoloring, etc. And my mom did not teach me that. 🙂 I am glad there are a few people like you in the world! I have a feeling when we get to Heaven we’re going to realize an awful lot of what we did here was just folding socks. a great parable, Shari. 🙂 I think I get it. Thank you Shari for sharing The Parable of the Socks. I understand what you are saying. Have a great day! I understand the parable. The agonizing part. And have been set free from the stress, although not as young as I wish. & by the way, all the cool kids wear mismatched socks on purpose these days! Or so I’ve heard, being a mom of mostly teenagers & young adults. Way easier to do the laundry! As a bachelor living alone, I just left my clean socks and underwear in a laundry basket stationed close to the bathroom door. I sorted out what I needed when I needed it. Very simple. I can see how this would be a beautiful system in a household of one or two!! Growing up in a family of 10 and having a mother with health struggles, guess how we did socks! any sock that did not have a partner readily available went into a pretzel can (anyone remember those 3 gallon cans). When we children needed extra work,(hmm wonder why children need extra work sometimes) we were sent to sort socks. I remember one time sorting out 70 pairs at one sitting. I must have found healing because I actually enjoy sorting socks today. I also recommend The Facts and Fictions of Minna Pratt as a source of wisdom on what to do with the socks that have permanently lost their partners.